Toward the end of 2017 we heard rumblings of a TNA/IMPACT-produced Samoa Joe DVD slated to join the recently-released Superstar profiles on Booby Roode, Eric Young, and AJ Styles. “The Essential Samoa Joe Collection”, a 3-disc DVD set, did wind up releasing to fans in the United States late last year and to Europe earlier this month. Official information confirmed 9 matches for the content, however if you’re curious about the full listing we can reveal it for you right now. The new 9-hour compilation features a total of 23 matches from current WWE Superstar Samoa Joe’s decade-long tenure with TNA; from his debut match at Slammiversary 2005 shortly after signing a contract, right through to one of his final matches with the company at Bound for Glory 2014. A special thanks to WDN reader Aaron W for sending word. 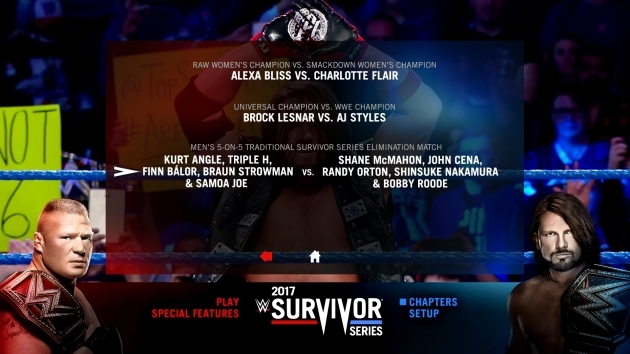 Following the recent release of Survivor Series 2017 on DVD in the United States, Canada and Australia, the PPV event is about to land on Blu-ray format for the first time! 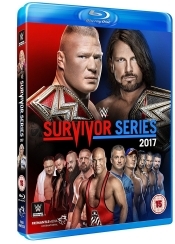 One week from today Survivor Series will hit stores in the UK both on DVD and as an exclusive Blu-ray; grab it here on Amazon.co.uk. It will feature the entire match card (headlined by AJ Styles vs. Brock Lesnar and the 5-on-5 RAW vs. SmackDown Live Survivor Series Elimination Match) as well as the Kickoff Show matches in the extras. – United States: RIGHT NOW! Get your Survivor Series DVD now here on Amazon.com. – Australia: RIGHT NOW! Get your Survivor Series DVD ordered at Madman.com.au. – UK/Europe: NEXT WEEK! Get your Survivor Series DVD (or the Blu-ray) on Amazon.co.uk. 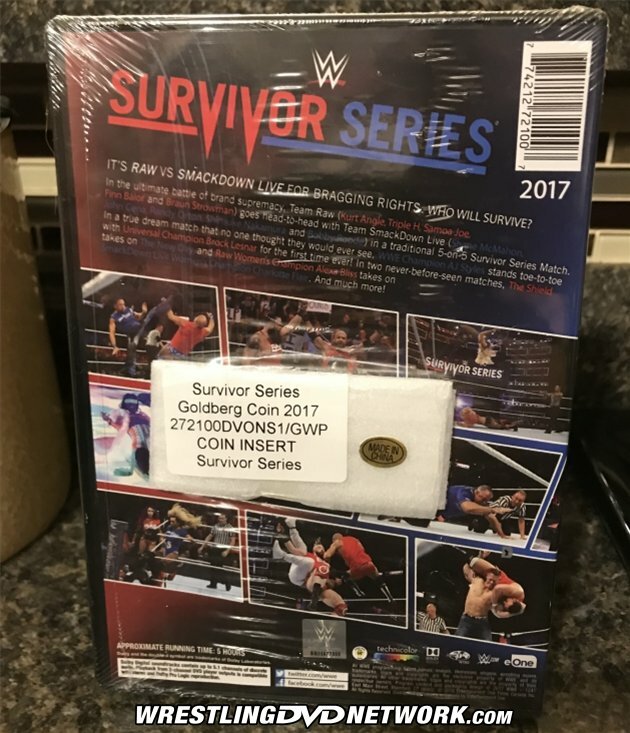 Speaking of the Survivor Series DVD, an Amazon exclusive version of it has been released in Canada. 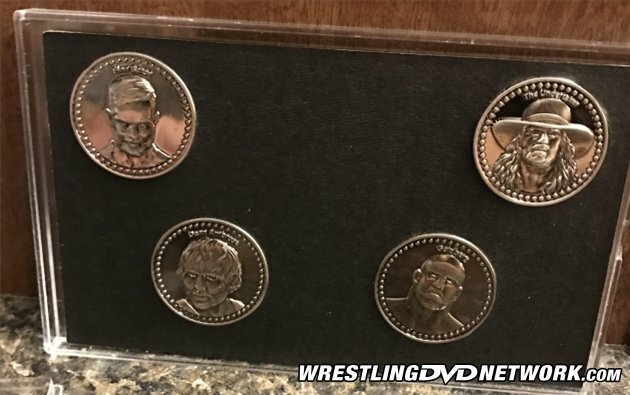 It completes the “WWE: Official Coin Collection 2017” display case with a Survivor Series coin that features soon-to-be WWE Hall of Famer, Goldberg! 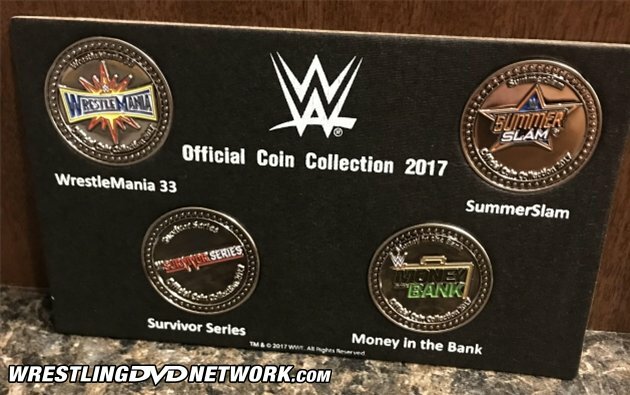 The coin collection (shown in its complete form below) has 4 coins – The Undertaker, Dean Ambrose, Finn Bálor, and Goldberg – all found in Amazon exclusive offerings of the WrestleMania 33 DVD, Money in the Bank 2017 DVD, SummerSlam 2017 DVD, and Survivor Series 2017 DVD. Many thanks to WDN reader Jeffrey for the pics. 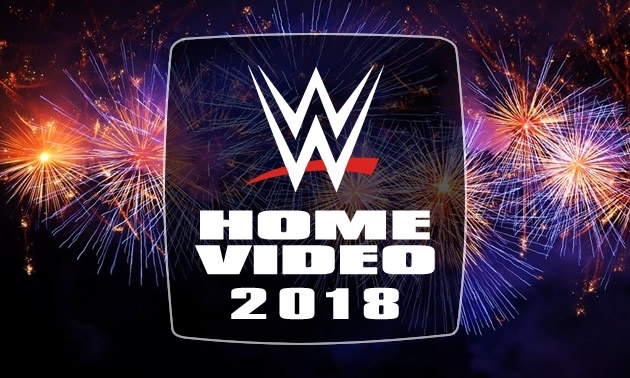 For those asking about the status of WWE’s 2018 Home Video releases, we would like to once again assure you that everything is going ahead as scheduled and as we’ve reported. There has been–and still remains–an issue or delay with Amazon listing upcoming titles to purchase. This appears to only be affecting Amazon since other retail sites are selling the 2018 WWE DVDs as normal. The first release of the new year, “Best Pay-Per-View Matches 2017”, is available across the board and has just been listed by WWE themselves here on WWEShop.com. From what we can gather the Amazon delay is a simple case of this retail site (and others like them) not receiving artwork for said missing DVDs because the domestic Home Video distributor has not yet uploaded it – and in the case of Amazon that tends to mean the product is not ‘live’ or shown publicly until the assets are available. It sounds to us like an issue that could be easily resolved soon. Clash of Champions 2017 is the next WWE DVD scheduled for release this year (out tomorrow), while we’ve received a synopsis for the “Double Feature: Elimination Chamber & Fastlane 2018” DVD that’s on the way in April. With that we also have word that WWE will be continuing to include collectible Topps trading cards inside the packaging of all PPV DVDs. First up on our latest eBay Watch is this rather good deal on the brand new NXT DVD set! …and “LOTS” more rare WWF DVDs are up for grabs if you know where to look! Where can I get the last coin? Just to let you know, nobody seems to have Clash Of Champions being out today. Supposedly it will be in stores Thursday or Friday, but I figure it will likely be next Tuesday. Thanks for the match listing! Hadn’t been able to find it anywhere on the net despite it being released for a while. Impact apparently expect you to purchase a 3-disc set without knowing what you’re buying, lol. Kinda sums up everything about them these days. Also, lol @ the gap between 2010 and 2014 (yet we have TWO matches vs. Booker T? ), nothing from 2015 just to bring us fully up to date on his career, and not including Joe vs. Sting at BFG 2008. They have the opportunity to release the definitive Joe release, and still manage to mess it up. Should’ve been a four-disc release like AJ’s really, but I guess an extra disc bumps up the production costs by quite a lot. I’m not surprised by their incompetence. This is a company that changed its name 3 times last year in a span of about 3-4 months. TNA to Impact to Global Force Wrestling to Impact. Lol, I know. The worst part is how they only sign people for an individual set of tapings, meaning you can’t get invested as a viewer in any of their characters because they may be gone at a moment’s notice at the end of that two months of TV, without their storyline being wrapped up properly. I’ve firmly always believed that if a released set has Ultimate or Essential and/or Collection in the title, it should include matches/segments that were essential to the respective talent’s career whether it’s been seen or released many times on many other sets or not. While I’d take Joe vs Sting, BFG08 over the tag match involving these 2 that are on the set, I’m quite happy to see Joe’s matches with Kurt Angle and the triple threats involving Styles & Daniels made its way into the Joe dvd. Have to admit the tracklist isn’t ideal but it’s impossible to cram all of the best into that timeframe. Styles had four disc & still didn’t get everything. to be fair, that set was released more than 11 years ago. I’m quite certain TNA/IW assumes that a giant percentage of the potential buyers of this new set are people that haven’t bought it back then (many of which probably didn’t even knew Samoa Joe until he got to the WWE). The downside of these TNA collections – its just a convenience thing is these matches aren’t listed, not even in the DVD menus. There are just still pictures representing each match, no words, nothing. You basically have to guess what match it is by looking at banners, if its from a PPV or Impact. Its just match after match after match with no transition in between. I found it very amateurish and bush league. The Samoa Joe and Bobby Roode DVDs have PPV matches so its pretty easy to find out. The Eric Young one has lot of Impact matches so its a bit difficult to figure out the dates. They also include a lot of footage that’s irrelevant to the wrestler profiled. Such as the debut of Bobby Lashley on Samoa Joe’s DVD and a promo about Hulk Hogan and Kevin Nash before a match on Eric Young’s. Absolutely. When I watched the Bobby Roode Collection, I sat with a notepad, and sorte the matches down. Really? That’s ridiculous! Even WWN indy DVDs are better presented than that, lol. Yeah, there isn’t even really a main menu on them. The DVDs just go straight to a scene/match selection screen. There’s no way of telling what match you’re selecting. in the end, it’s just a cash grab. that being said, if you don’t own those matches already (or at least the vast majority of them), I’d say they are still worth it. I loved the 3 disc Bobby Roode DVD that TNA did. Unfortunately I have most of these Samoa Joe matches in my collection, so I won’t be getting this. Can you send the tracklist for that Roode set? Thanks. I believe the first match is from Unbreakable 2005. Really weird that they start with a match from 2005, and then jump back to 2004. In my ways I feel like his loss to Angle at BFG ’11 was a true low point of his career, since it was such a bonehead booking decision and went down like a lead balloon on the night. He was gonna win the belt that night,But Hogan nixed it at the last second. Yeah, certainly not a moment that should be on a Bobby Roode ‘Best Of’! Guilty, I went in thinking it was a wwe match listing.